14″ plate of ash. This is called “guitar ash,” as it’s often used for solidbody guitars. Lots of big, open grain with differing degrees of hardness. The scientific name is fraxinus, which is a very fun word to say. White Ash candlesticks, from a tree that my son chopped down several years ago. Striking grain, but really difficult to turn. 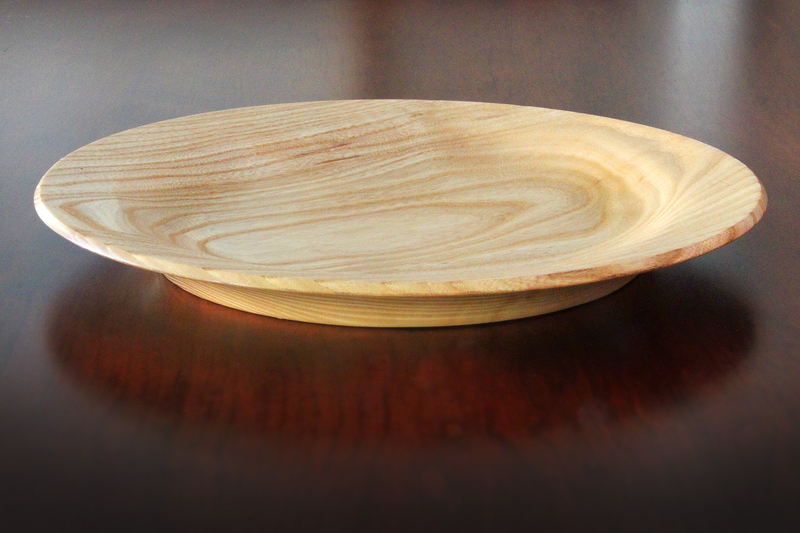 10-inch plate of English Walnut, a soft and beautiful wood. This piece has a stunning bit of dark heartwood on display. Lots of wonderful color and movement in this piece of Oregon myrtle. Plenty of worm holes too. Plus there’s a nice scene on the bottom of the sunset over Mount Shasta. A little goblet—more like a champagne flute—made of bloodwood. No stain on this: that’s the natural color of the wood. Beautiful.